When something works, and works as well as it does here, the temptation to return is unavoidable. 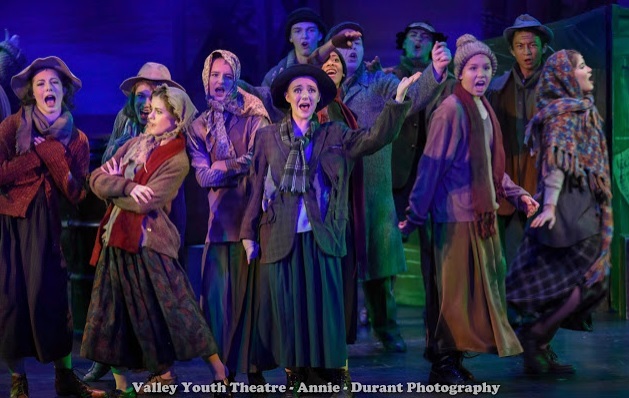 Besides, there’s a difference when you’re the Valley Youth Theatre and you’re returning to Annie. Each new presentation of the show brings a whole new generation of both cast members and audiences alike who have never before seen the musical. Perhaps some have never even heard of it. 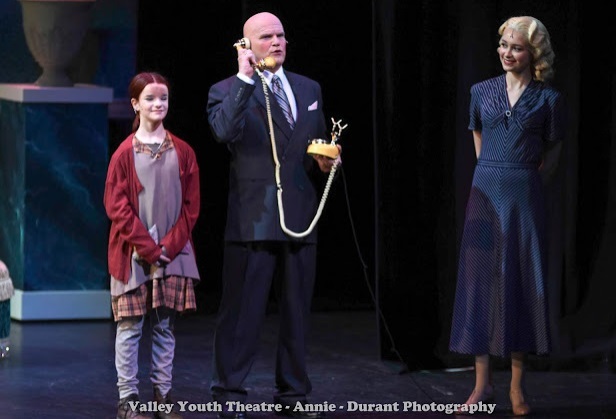 Since October of 1997, the VYT production of the Broadway musical Annie has played not at its smaller venue on North First Street but several blocks away at the Herberger Theater Center, downtown. Until this past weekend, VYT had presented it three times. 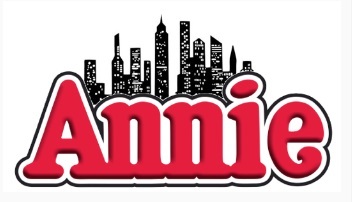 Now, with its 41st Herberger Center production, after a seven-year absence, Annie returns for the fourth time, both to close the current 2017-18 season and to give many of its young cast the thrill and the opportunity of appearing on the stage at the city’s most reputable live-theatre. Backed by a robust sounding twenty-one piece orchestra under the direction of Mark Fearey, with impressive scenery and props provided by Vance Entertainment, LLC, from the moment the curtain rises on yet another late night at the New York Municipal Orphanage for little girls, that sense of theatrical professionalism for both sight and sound is immediately established. And it’s that sense of expertise that often comes as a surprise to many audience members who are perhaps seeing their son or daughter in a VYT production for the first time. To pass the audition is one thing, but to suddenly see young family members dancing and singing on stage with their talented peers in a manner exhibiting never before seen discipline and previously untapped abilities is altogether something else. Plus, as is often the case when VYT moves camp for a large-scale production across town, while the majority of the performers are made up of age-appropriate actors, some of the key adult roles are played by adults, and it makes all the difference. As written in the program notes, back in ‘97 when director Bobb Cooper was putting together his first production of Annie, no one auditioned for the role of billionaire Daddy Warbucks. With time short and decisions needed to be made, Bobb shaved that famous coif and played the role himself. 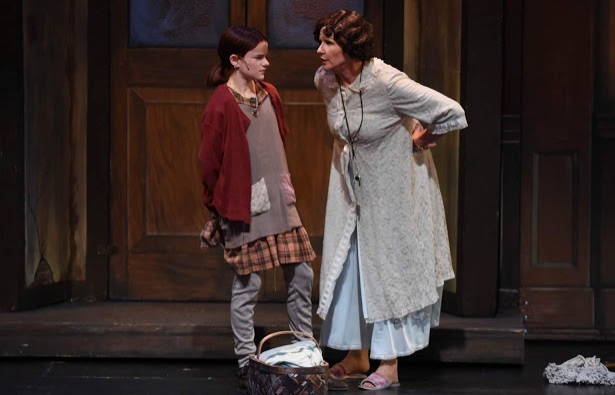 Plus, as a balance, his wife, VYT’s costume designer, Karol Cooper, was cast as the villainous Miss Hannigan. With the new 2018 production, this will make the fourth time the husband and wife team have played in Annie, and the first time this column has had a chance to write about them. But it should be said, reviewing the Coopers not as producers but as performers feels undeniably odd. As the orphanage matron, a woman adverse to all things little, especially little girls, but loves knocking back a bottle of whiskey, Miss Hannigan is a role tailor-made for broad comedy; traditionally, the broader the better. Karol’s approach is somewhat different. She doesn’t possess quite the aggressive projection of a loathsome, depression-era Ethel Merman stuck in a never-ending job looking after little girls. With a half-empty bottle of something alcoholic hidden in her pocket and her fists clenched, ready to duke it out with anyone smaller than herself, Karol’s Miss Hannigan is played more like the latter days of a comical Ruth Gordon at her most cantankerous, one suffering from a perpetual hangover. It’s effective without being overplayed. With that famous coif shaved once again, Bobb Cooper’s Daddy Warbucks seems friendly from the outset. It should take a little while before little orphan Annie breaks through the gruffness of his take-no-prisoners, billionaire demeanor, but when it’s Bobb under the baldness, that demeanor seems to break down considerably faster; his Warbucks is likable the moment he walks on. There’s a stiffness to his movement that has him characteristically walking without the use of his arms, something that also carries into the dancing. Watching Bobb move, particular when paired with Annie (Mia McFarland), is like watching your favorite, clumsy celebrity trying his best each week to get the votes on Dancing With The Stars, the one that everyone warms to but knows he’s unlikely to make it. Yet seeing both Bobb and Karol Cooper under these circumstances, in costume while singing and dancing among the same children they help to nurture and encourage the appreciation of theatre, has an unexpected, endearing quality to it. 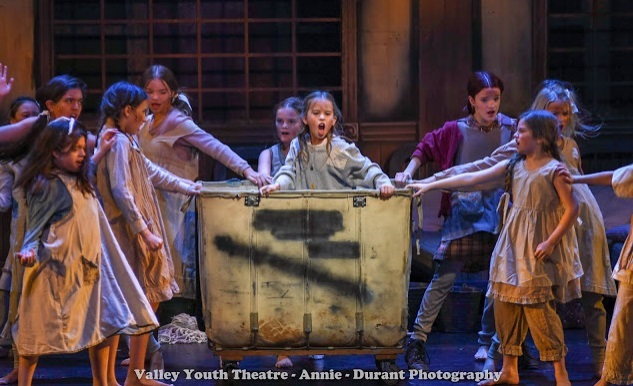 But in a youth production, the emphasis should be on the youth, and this VYT production of Annie scores big with its talented, youthful ensemble. Mia McFarland’s Annie is terrific. She’s just as you would want from a live presentation of the little girl hoping to find her long-lost parents; strong, energetic, playfully funny, and a voice with a power that can easily be heard by everyone in the back row of the upper balcony without amplification. Special mentions also to Isabella Conner who gets things just right as the scheming and somewhat dimwitted girlfriend, Lily St. Regis; Brandon Brown, equally good as the convict ne’er-do-well brother, Rooster, and particularly Olivia Smith who brings a keen sense of propriety and maturity to her role as the good-natured, faithful secretary, Grace. 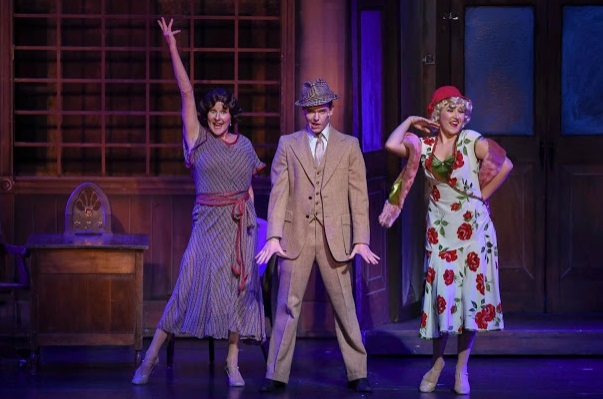 The feisty orphan girls, with their aggressive delivery, dance moves, athletic backflips, and harmonious singing voices, hit the bullseye with both It’s A Hard-Knock Life in the first half and You’re Never Fully Dressed Without A Smile in the second. With Nathalie Velasquez’s energetic choreography and Feary’s musical direction, as with all the ensemble production numbers, including We’d Like To Thank You (Herbert Hoover) and A New Deal for Christmas, you can feel a mounting sense of excitement from the audience that has it wanting to leap to its feet long before the song is over. It’s surprising just how large this cast truly is, something you may only realize at the end when everyone is finally on stage together to take that final bow. Having not seen the previous VYT Annie productions, it’s difficult to make a comparison. But being aware that, other than the two adult roles of the Coopers, every other cast member is new, and VYT has a reputation of trying new things, even with shows performed successfully before, it feels safe to say what you’ll see this time around at Herberger is not what was previously seen. Probably better. And if it’s inspired a new generation of potential VYT actors (those suddenly enamored with the effectiveness of just how good live theatre has the ability to transport them to wherever they need to go) to hand in their resumes to director Bobb Cooper for future consideration, then the job is truly done.